Endoscopic surgery is now commonly used in the management of simple and complex pathologies of the frontal sinus. As experience with the endoscopic technique has grown, use of these procedures for frontal sinus surgery has increased. The goals of endoscopic frontal sinus surgery include disease eradication, implementation and maintenance of an adequate drainage and ventilation pathway, and the restoration of mucociliary function. Frontal sinus pathology is particularly challenging to treat due to the narrow and complex anatomy of the frontal outflow tract (see the images below). Stenosis of the frontal recess is best prevented by avoiding unnecessary manipulation of the outflow tract and meticulous surgical technique. Without formal frontal ostium dissection, anterior ethmoidectomy with exposure of the frontal recess has been shown to result in resolution of frontal sinus disease. The indications for a formal frontal sinusotomy should therefore be carefully determined. If frontal recess dissection is undertaken, meticulous tissue handling with avoidance of any mucosal trauma is key to a successful outcome. Routine frontal stenting is unnecessary (see image below). 3A: Intraoperative endoscopic view of the dissected frontal ostium after total anterior ethmoidectomy and Draf 2a frontal ostioplasty (70º endoscope view): (A) nasal beak, (B) frontal neo-ostium, (C) anterior skull base. Postoperative view of frontal ostium with a 70º endoscope. 3b: Well-healed, mucosalized frontal neo-ostium 3 months after Draf 2a (frontal ostioplasty). No stent was used in this case. The most common cause of restenosis of the frontal sinus outflow tract is iatrogenic (postoperative scarring, adhesions, and middle turbinate lateralization). Severe inflammatory pathology, obstructive polyposis, and nonsurgical trauma are other common causes. The incidence of persistent frontal sinusitis with symptoms after endoscopic sinus surgery is 2-11% based on numerous studies, all with relatively short follow-up. The necessity of longer follow-up after frontal sinus surgery to determine the true incidence of disease relapse was demonstrated by Neel et al. In their study, failure rate after modified Lynch procedure increased from 7% at 3.7 years to 30% at 7 years. Frontal sinus stenting may help prevent failure of standard endoscopic treatment of frontal sinus disease by maintaining patency and structural integrity of the frontal sinus outflow tract while regeneration of the frontal neo-ostium mucosal lining takes place. In many situations, such as after a drill-out procedure (modified Lothrop or Draf III) for neo-osteogenesis or tumor removal, the mucosal lining is absent or significantly violated. Stenting may be useful in such situations. Surgically placed stents to maintain ventilation and drainage of the frontal sinuses have been used for over a century. The first frontal sinus stents were gold tubes used in 1905 by Ingals. In 1921, Lynch first described his frontoethmoidectomy technique, of which a key component was 1-cm rubber tubing used to stent the frontal sinus. Progress in both surgical instrumentation and new stent material has been made over subsequent years. Numerous options are now available for stenting in cases that have an anticipated high risk of surgical failure. Stents differ in terms of material, shape, and the techniques used to deploy them. Despite the long history of frontal sinus stents, no universally accepted criteria exist for their use. Stenting may be considered in a patient who has failed standard ethmoidectomy or frontal sinusotomy, or in whom a high likelihood of failure to maintain a patent recess is expected. Authors have advocated different criteria to stent the frontal recess. The size of the frontal sinus neo-ostium created after frontal sinusotomy has been used as a guide for sinus stenting by some authors. [4, 5, 7] However, as the natural size of the recess itself is small, stenting is likely unnecessary unless extensive mucosal disruption exists. In a study correlating frontal neo-ostium size to postoperative patency, Hosemann et al found the postoperative stenosis rate of a frontal neo-ostium less than 5 mm in diameter to be 33%, whereas the stenosis rate was 16% with an intra-operative neo-ostium diameter of greater than 5 mm. Thus, for a neo-ostium size of less than 5 mm, stenting may be indicated. Additional indications for frontal sinus stenting include the presence of osteitic bone, purulence, or granulation indicating severe inflammatory disease. The presence of vasculitides or granulomatous disease, previous surgical failure, excessive removal or destabilization of the middle turbinate predisposing to lateralization, traumatic fracture of the frontal sinus outflow tract,  and the presence of extensively denuded or circumferentially exposed bone around the neo-ostium perimeter  are other proposed indications. In the case of stripped mucosa surrounding the frontal neo-ostium, stents have also been used to hold a mucosal graft in place. Dubin and Kuhn described endoscopic resection of 12 frontal sinus osteomas with preservation of the natural frontal sinus outflow. They stented all cases with greater than 40% denuded frontal recess mucosa. Some authors have also advocated using soft silastic stents in uninjured frontal recesses to assist with postoperative debridement. The stents are removed 2-3 weeks after surgery. During removal, the adherent clots and crusts caught within the stents are reported to be more easily removed. No absolute contraindications exist to placement of a frontal recess stent. The key to prevention of frontal recess stenosis is meticulous mucosal preservation. Routine stenting of the frontal recess is unnecessary. Manipulation and trauma of the frontal recess during frontal stent placement and any inflammatory reaction caused by the stent itself may lead to scarring and poor healing of the recess. Concern also exists for the formation of biofilms, which are known to perpetuate an inflammatory tissue response. Stenting should only be used for limited indications for a well-defined period of time. A narrow dimension in any plane should be noted preoperatively and stenting used as deemed necessary. Frontal sinus stents are generally well tolerated, and the complication rate is low. Nonetheless, some concern exists that stents can serve as a potential nidus for recurrent infections (see the image below). In a study by Perloff and Palmer, evidence of bacterial biofilms was found ubiquitously on silastic frontal sinus stents removed from six patients at 1-4 weeks following endoscopic sinus surgery. The clinical significance of this finding in predisposing to recurrent infection, however, is unknown. Stents can also serve as a source of iatrogenic obstruction of the frontal sinus outflow tract when they are trimmed too short, in which case granulation tissue can form across the stent, embedding it in place. A stent that is too long may cause crusting at the distal end, which can lead to nasal congestion and an unpleasant odor. Avoidance of these complications requires proper trimming of the stent after insertion. Stents should be trimmed approximately to the level of the inferior border of the middle turbinate. Toxic shock syndrome (TSS) is a rare life-threatening risk following frontal sinus stenting. Vigilance for symptoms of TSS such as high fever, hypotension, diffuse macular erythroderma, mucosal hyperemia, mental status changes, and desquamation is required. TSS onset can occur several weeks postoperatively, as in Chadwell’s case,  in which symptoms developed on postoperative day 18 after the patient had completed a 7-day course of cephalexin. Antibiotic prophylaxis has been relatively unsuccessful in the prevention of TSS, which is related to toxin-producing Staphylococcus aureus. A potential for stent migration and accidental aspiration also exists. During stent removal, a theoretical risk of stent breakage can leave remnants in areas of the sinus with limited or difficult access. Illing EA, Cho do Y, Riley KO, Woodworth BA. Draf III mucosal graft technique: long-term results. Int Forum Allergy Rhinol. 2016 May. 6 (5):514-7. [Medline]. Becker SS, Han JK, Nguyen TA, Gross CW. Initial surgical treatment for chronic frontal sinusitis: a pilot study. Ann Otol Rhinol Laryngol. 2007 Apr. 116(4):286-9. [Medline]. Orlandi RR, Knight J. Prolonged stenting of the frontal sinus. Laryngoscope. 2009 Jan. 119(1):190-2. [Medline]. Neel HB 3rd, McDonald TJ, Facer GW. Modified Lynch procedure for chronic frontal sinus diseases: rationale, technique, and long-term results. Laryngoscope. 1987 Nov. 97(11):1274-9. [Medline]. Malin BT, Sherris DA. Frontal sinus stenting techniques. M. Friedman. Operative Techniques in Otolaryngology. Elsevier; 2010. 175-180. Lynch RC. The technique of a radical frontal sinus operation which has given me the best results. Laryngoscope. 1921. 31:1-5. Rains BM 3rd. Frontal sinus stenting. Otolaryngol Clin North Am. 2001 Feb. 34(1):101-10. [Medline]. 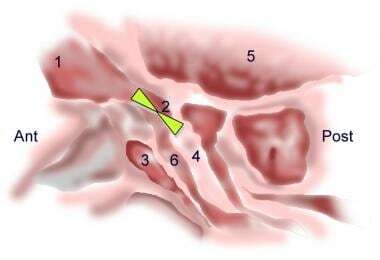 Hosemann W, Kuhnel T, Held P, Wagner W, Felderhoff A. Endonasal frontal sinusotomy in surgical management of chronic sinusitis: a critical evaluation. Am J Rhinol. 1997 Jan-Feb. 11(1):1-9. [Medline]. Hunter B, Silva S, Youngs R, Saeed A, Varadarajan V. Long-term stenting for chronic frontal sinus disease: case series and literature review. J Laryngol Otol. 2010 Nov. 124(11):1216-22. [Medline]. Dubin MG, Kuhn FA. Preservation of natural frontal sinus outflow in the management of frontal sinus osteomas. Otolaryngol Head Neck Surg. 2006 Jan. 134(1):18-24. [Medline]. Perloff JR, Palmer JN. Evidence of bacterial biofilms on frontal recess stents in patients with chronic rhinosinusitis. Am J Rhinol. 2004 Nov-Dec. 18(6):377-80. [Medline]. Chadwell JS, Gustafson LM, Tami TA. Toxic shock syndrome associated with frontal sinus stents. Otolaryngol Head Neck Surg. 2001 May. 124(5):573-4. [Medline]. Neel HB, Whicker JH, Lake CF. Thin rubber sheeting in frontal sinus surgery: animal and clinical studies. Laryngoscope. 1976 Apr. 86(4):524-36. [Medline]. Freeman SB, Blom ED. Frontal sinus stents. Laryngoscope. 2000 Jul. 110(7):1179-82. [Medline]. Weber R, Mai R, Hosemann W, Draf W, Toffel P. The success of 6-month stenting in endonasal frontal sinus surgery. Ear Nose Throat J. 2000 Dec. 79(12):930-2, 934, 937-8 passim. [Medline]. Hosemann W, Schindler E, Wiegrebe E, Gopferich A. Innovative frontal sinus stent acting as a local drug-releasing system. Eur Arch Otorhinolaryngol. 2003 Mar. 260(3):131-4. [Medline]. Beule AG, Scharf C, Biebler KE, et al. Effects of topically applied dexamethasone on mucosal wound healing using a drug-releasing stent. Laryngoscope. 2008 Nov. 118(11):2073-7. [Medline]. Herrmann BW, Citardi MJ, Vogler G, et al. A preliminary report on the effects of paclitaxel-impregnated stents on sheep nasal mucosa. Am J Rhinol. 2004 Mar-Apr. 18(2):119-24. [Medline]. Huvenne W, Zhang N, Tijsma E, et al. Pilot study using doxycycline-releasing stents to ameliorate postoperative healing quality after sinus surgery. Wound Repair Regen. 2008 Nov-Dec. 16(6):757-67. [Medline]. Santarelli GD, Han JK. Evaluation of the PROPEL® mini sinus implant for the treatment of frontal sinus disease. Expert Opin Drug Deliv. 2016 Dec. 13 (12):1789-1793. [Medline]. Li PM, Downie D, Hwang PH. Controlled steroid delivery via bioabsorbable stent: safety and performance in a rabbit model. Am J Rhinol Allergy. 2009 Nov-Dec. 23(6):591-6. [Medline]. Murr AH, Smith TL, Hwang PH, et al. Safety and efficacy of a novel bioabsorbable, steroid-eluting sinus stent. Int Forum Allergy Rhinol. 2011 Jan-Feb. 1(1):23-32. [Medline]. Forwith KD, Chandra RK, Yun PT, Miller SK, Jampel HD. ADVANCE: a multisite trial of bioabsorbable steroid-eluting sinus implants. Laryngoscope. 2011 Nov. 121(11):2473-80. [Medline]. Marple BF, Smith TL, Han JK, et al. Advance II: a prospective, randomized study assessing safety and efficacy of bioabsorbable steroid-releasing sinus implants. Otolaryngol Head Neck Surg. 2012 Jun. 146(6):1004-11. [Medline]. Metson R. Endoscopic treatment of frontal sinusitis. Laryngoscope. 1992 Jun. 102(6):712-6. [Medline]. Lin D, Witterick IJ. Frontal sinus stents: how long can they be kept in?. J Otolaryngol Head Neck Surg. 2008 Feb. 37(1):119-23. [Medline]. Wormald PJ. Surgery of the frontal recess and frontal sinus. Rhinology. 2005 Jun. 43(2):82-5. [Medline]. Weber R, Hosemann W, Draf W, Keerl R, Schick B, Schinzel S. [Endonasal frontal sinus surgery with permanent implantation of a place holder]. Laryngorhinootologie. 1997 Dec. 76(12):728-34. [Medline]. Banhiran W, Sargi Z, Collins W, Kaza S, Casiano R. Long-term effect of stenting after an endoscopic modified Lothrop procedure. Am J Rhinol. 2006 Nov-Dec. 20(6):595-9. [Medline]. Forwith KD, Han JK, Stolovitzky JP, Yen DM, Chandra RK, Karanfilov B, et al. RESOLVE: bioabsorbable steroid-eluting sinus implants for in-office treatment of recurrent sinonasal polyposis after sinus surgery: 6-month outcomes from a randomized, controlled, blinded study. Int Forum Allergy Rhinol. 2016 Jun. 6 (6):573-81. [Medline]. Examples of frontal sinus stents: (A) Sheet of 1/100-inch thick silastic fashioned into a T-shaped stent, (B) reinforced silastic sheet used for Draf 3 cavity, (C) Rains silastic stent, (D) Silastic T-tube stent, (E) Acclarent Relieva Stratus MicroFlow Spacer, (F) Intersect ENT Propel sinus implant (FDA approved for use in the ethmoid sinus; use in the frontal sinus as a stent is off-label). Endoscopic placement of right frontal sinus stent after a revision Draf 2b frontal ostioplasty in a patient with previous surgery and radiation for esthesioneuroblastoma. (A) 1/100 thick silastic sheet is cut into a T shape based on the size of the frontal ostium, (B) right frontal ostium; view with a 70º endoscope, (C) the sheet is to be rolled into a stent, grasped with giraffe forceps, and the T flange inserted into the frontal sinus, (D) the rolled part of the stent lines the area of the frontal recess. Frontal sinus stenting in a Draf III cavity. A Draf III (endoscopic modified Lothrop) procedure was performed in a patient with right frontal muco-pyocele and extensive osteitis in the frontal recess. (A) Frontal neo-ostium after modified Lothrop with extensive bone devoid of mucosal lining. (B) Soft silastic stent placed in the neo-ostium for 6 weeks. (C) Well-healed and remucosalized frontal neo-ostium at 6 months postoperatively.